Product Group: Pets Bookmark To MyTotalUSA! Acrylic Reptile Cage. 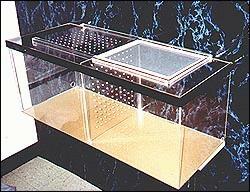 Lift off top, sliding top vent, drilled air holes and mesh screen. Has removable center divider. 18"x18"x36"